at the Arts Centre at Cedar Hill, May 15-27, 2014. Opening by invitation Thursday May 15, 5-8PM. Christine Reimer in her studio, April 2014. “Glacier in the Icefields Highway, Jasper” 30x40 in. 2011. 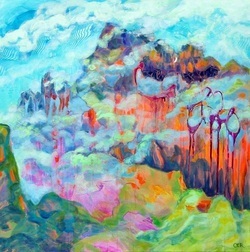 “Mystic Landfall” 36x36 in. 2014. “Spring Transformation” 30x40 in. 2013. 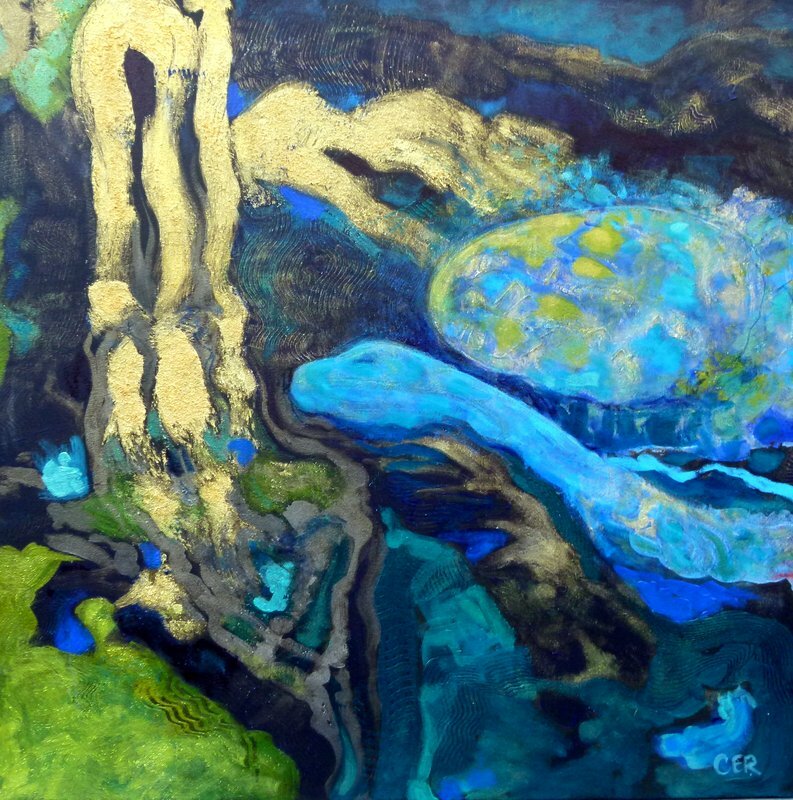 To re-boot her painting process, Reimer began by editing her nature photographs into abstractions. 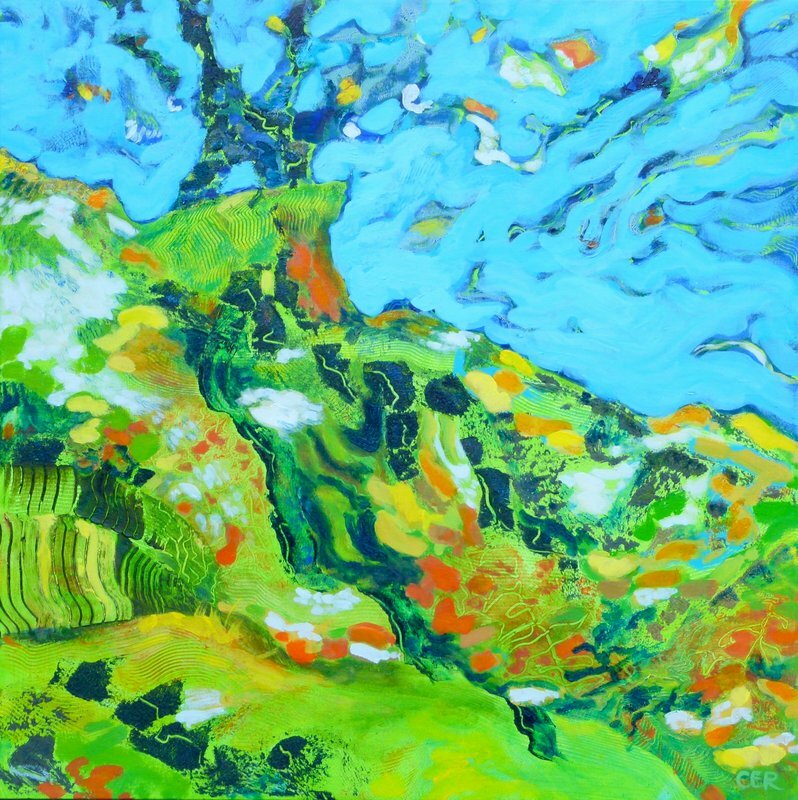 She moved to smaller canvases, experimenting with different acrylic grounds, glazes and mediums. Using various tools to draw through the paint, she created random marks and textures without conscious thought, until imagery and ideas emerged. “Tree in Flight” 30x30 in. 2014. 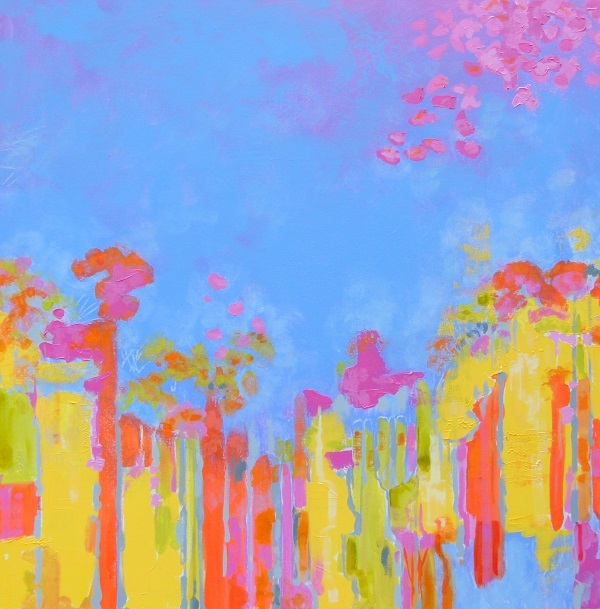 “Spring Blossoms” 36x36 in. 2014. "Weight of the World" 36x36 in. Ken Campbell stands between Seeking Heat (on viewer’s left) and Love Letters from Home (Ukraine). Ken respects his colleague’s skill as a colourist. For Ken, “Seeking Heat” echoes the virtuosic abilites of abstract painter Neil Fujita (1921-2010). Whereas, in “Love Letter from Home” he sees references to the early cubist work of Juan Gris (1887-1927) and Pablo Picasso (1881-1973). Sally Stubbs is a playwright and drama instructor with master degrees in Art History and Creative Writing. A life-long friend of the artist, she’s taken part in the transitional process surrounding Christine’s grief. “I started to see a shift in Christine during our trip to England in 2013,” she says. Sally noticed her friend re-engaging with visual ideas and images, often through photography. In The Tipping Point, Sally sees the themes of release, transformation and rebirth encapsulated by the egg shape and ocean blue void. From the void, the twisted tree forms emerge, tentatively pushing through deep layers of indigo hues and crackling metallic texture. “This artistic journey has landed Christine in a brand new place,” Sally concludes. Richard Chambers is a dentist and collector of Reimer’s paintings. During his country excursions, Richard looks for scenes from his paintings. A favourite in his collection features a church and graveyard from the Cowichan Valley. His hobbies include sculpting figurative works in clay, inspired by classical and First Nations’ themes. Richard’s favourite painting, When the Moon Falls From the Sky, features a circular disk spiraling down to earth. “I like being able to see the landscape,” he says, “and the receding mountain ranges on which the moon hovers.” The greenish-yellow orb rests on a dramatic background of colours, ranging from twilight blue to sunny orange. Neil Hamilton is a long time neighbour and friend of the artist. He praises Christine’s generous personality and ability to embrace all aspects of life. Neil’s favourite painting is Mysterious Pathways (at top of photo). He likes the combination of the colours, and the way the shapes coalesce into a warm peaceful centre. The rich iridescent blues and greens remind him of Ammonite, an opal-like gemstone made of fossilized shells. In contrast, Neil notes the bottom painting, Underground Stream has elements of darkness and departure, represented by the serpent image and truncated torso. He sees a yin-yang relationship between these two paintings. Kate Cino with Christine Reimer. Public Relations certificate from the University of Victoria. For ten years, Kate operated an art & framing shop.